Pearls, like diamonds, seem to be on everyone’s wish list as of late. And, like diamonds, there are seemingly countless choices to make: Freshwater? Cultured? Tahitian? South Sea? Color? Size? Luster? The list goes on. Here’s a quick pearl 101 lesson. The best in the world can be categorized into four types. Here’s hoping this helps make your next shopping decision a little easier. Known as the “icon” of cultured pearls, Akoya pearls have graced the necks, ears, fingers, and wrists of women for decades. They are round in shape and the color is white. Akoya Pearls range in size from as small as 3.0mm to as large as 9.5mm. 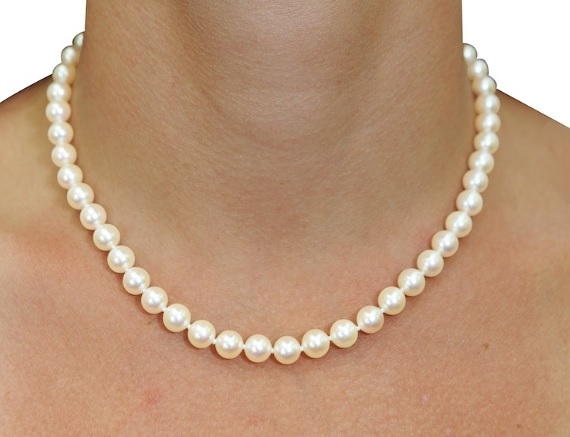 Pearls below 7.0mm are considered small in size. 7.0mm until 8.0mm are generally the more popular sizes selected for necklaces, while anything above 8.0mm is considered to be more rare and valuable, especially in the higher qualities. Tahitian pearls are named so because, surprise, surprise they are found in Tahiti. Well, not just Tahiti but in other nearby Polynesian Islands. They are cherished for their incredibly exotic colors and mirror-like luster. Although they are known as “Black Pearls,” Tahitian pearls actually consist of the widest spectrum of exotic colors of any pearl such as peacock green, silver green, blue, and eggplant colors just to name a few. These pearls are produced by the Pinctada Margaritifera oyster, which is found exclusively in Tahiti and several other French Polynesian islands, according to The Pearl Source, an LA-based importer and wholesaler. South Sea Pearls are by far the most valuable and cherished pearls found on the market today. These pearls are produced by the silver or golden lipped oyster, known scientifically as the Pinctada maxima oyster, which are found on the shores of Australia, Indonesia and the Philippines. Both golden & white South Sea pearls are very rare and very difficult to find in most jewelry stores, especially in higher qualities. You’ll pay more for these pearls, but the quality is worth it. Freshwater pearls are typically found in lakes and rivers in China or Japan, and are produced in mollusks called mussels. Freshwater pearls have recently revolutionized the pearl industry by producing beautiful and lustrous natural white and pink pearls at a price that is a fraction of Akoya and smaller sized south sea pearls. They typically range in size from 5mm to 12mm, though occasionally some larger sizes can be found. Freshwater pearls below 7mm are considered small in size. 7mm until 9mm are generally the more popular sizes selected for necklaces, while anything above 10mm is considered to be more rare and valuable, especially in the higher qualities. Typically the larger the freshwater pearl the more difficult it is to find a round, lustrous pearl in that size. Whatever your taste or preference, be sure to go with a reputable jeweler if you’re in the market for a strand of pearls. Be sure to ask the right questions: where were they sourced? What is the size? How are they graded? Stick to these basic questions and you’re sure to walk away with pearl jewelry you’ll love.